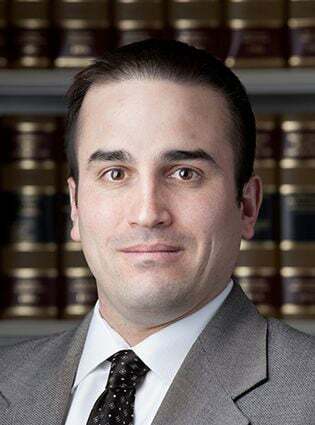 Attorney Robert D. Crivello accepted a position at Cannon & Dunphy S.C. soon after graduating from Marquette University Law School, where he graduated with honors in 2003. Now a partner at the firm, Mr. Crivello has earned a reputation as a skilled trial lawyer, securing numerous seven-figure verdicts and settlements for his clients, including an $8.3 million jury verdict for the family of a developmentally disabled adult who suffered a serious brain injury and is now paralyzed due to the negligence of a caretaker. Mr. Crivello has been recognized by the Wisconsin legal community as a top rated lawyer, as he was named a Super Lawyers Rising Star from 2008 to 2012, and has been named a Super Lawyer every year since 2013 in the area of personal injury. This means that Mr. Crivello is recognized by his peers as being in the top 5% of lawyers that practice personal injury in the State of Wisconsin. While he is proud of his record of success in and out of the courtroom, Mr. Crivello holds the appreciation of his clients as the greatest measure of his success. “I wanted to let you know how pleased my wife and I are with the results Attorney Robert Crivello was able to achieve for our daughter. From day one (1) Attorney Crivello was professional, honest, easy to talk to, and just a phone call away. He was a wonderful advocate for our daughter and we could not be happier with all of the hard work and time he devoted to her case. I have always felt the greatest compliment is a referral or recommendation and I can guarantee I will always do both if I ever know of anyone who needs a great attorney at a great firm! Looking back, we are so thankful to have contacted Cannon and Dunphy, and getting to work with Attorney Crivello!” – Brian O. “A good friend recommended Cannon and Dunphy to help resolve an unfortunate incident I was involved in. And, while the situation fortunately wasn’t one of life or death, it was important to our family that it be resolved equitably. Robert Crivello at Cannon and Dunphy was a consistent source of good counsel and sound advice throughout my recovery, and beyond. He was tough when necessary, but always patient and steady. We feel we were well represented by Robert, and would not hesitate to have him on our side should that need arise again.” – Paul R.
“My Mother was in a serious auto accident two and half years ago and is now being represented by Robert Crivello of Cannon and Dunphy. She met with Mr. Crivello and another attorney from C&D this past Friday and could not have been more pleased with the experience. She expressed how personable they both were and her confidence in their abilities.” – Tod K.
“Robert Crivello was my first experience with a lawyer and he made the experience a fantastic one. Attorney Crivello represented my son in a complex case regarding a canine attack. He was well versed in both current laws and knowing what my family’s needs would be during a very difficult time. His approachable and winning demeanor made our family very comfortable. He and the staff at Cannon & Dunphy S.C. were seemingly always available to answer any questions we had at such a chaotic time of surgeries, hospital stays and doctor visits. My impression of lawyers is forever changed because of the compassionate attention given to my son’s needs! I would recommend Cannon & Dunphy S.C., specifically Robert Crivello, for any and all personal injury needs. – Stacy H.
Thank you for accepting my car accident case and thank you to Cannon & Dunphy, S.C. too. I know I could never have handled it on my own and I was grateful to have you and such a prestigious firm represent me. I hope, as you said, never to have to call on you again. But, I am reassured to know that if there would be a problem, you are there. It has been very nice working with you and I wish you well personally and professionally. – Mary S.
I had incurred a very serious and permanent dog bite injury and was recommended to Cannon and Dunphy. I met with attorney Robert Crivello and was overwhelmed with his concern of the case and myself. He worked tirelessly for me, even though my case was smaller than he may be used to. I received excellent advice along the way, and the outcome was far greater than I expected. Mr. Crivello is a dedicated, intelligent and kind person. I never doubted I chose the right attorney and law firm. – Patricia W.
Thank you for your excellent representation in my personal injury claim. It has been a genuine pleasure to have your expertise, counsel and guidance. I am very pleased with the result of your efforts on my behalf. Throughout these many months you have, at all times, been professional, articulate, detailed, compassionate, personable and supportive in every way needed. I cannot thank you enough for making this difficult, protracted and, at times, distasteful process tolerable. Your knowledge and expertise; your patience explaining each and every step; presenting scenarios; risks and/or benefits; answering my questions; was an enormous factor in ensuring that each discussion and choice I made was fully informed and made with complete confidence. As busy as I knew you were, I never felt rushed or that you were not giving my every concern, large or small, your complete attention. – Mary K.
I was involved in a car accident that resulted in injuries,. My team of attorneys could not have been better. I was pleased with the way I was treated from the minute I walked through the doors at Cannon & Dunphy’s offices. I was treated with respect and kindness by their staff, and without out their expertise, my case would not have had the same outcome in court as it had. They respected me, my feelings and beliefs throughout every step. Never was I a number to them. I cannot speak highly enough of Sarah Kaas and Robert Crivello. Thank you, your reputation speaks of your hard work and the job you did for me. – Kathy R.